The low cost leader in any market gains competitive advantage from being able to many to produce at the lowest cost. Factories are built and maintained, labor is recruited and trained to deliver the lowest possible costs of production. ‘cost advantage’ is the focus. Costs are shaved off every element of the value chain. Products tend to be ‘no frills.’ However, low cost does not always lead to low price. Producers could price at competitive parity, exploiting the benefits of a bigger margin than competitors. Some organizations, such as Toyota, are very good not only at producing high quality autos at a low price, but have the brand and marketing skills to use a premium pricing policy. With a cost focus a firm aims at being the lowest cost producer in that niche or segment. 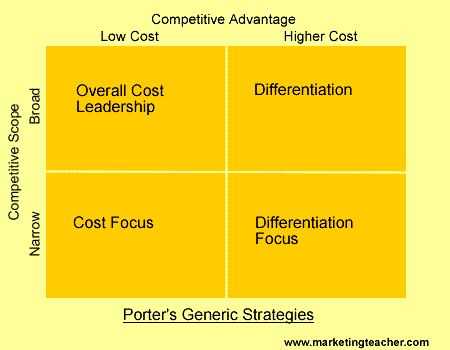 With a differentiation focus a firm creates competitive advantage through differentiation within the niche or segment. There are potentially problems with the niche approach. Small, specialist niches could disappear in the long term. Cost focus is unachievable with an industry depending upon economies of scale e.g. telecommunications.